If not LIBOR then what? Which RFRs have been identified? ICE Benchmark Administration (IBA), the organisation which currently administers the LIBOR screen based rates, has this morning unveiled a proposed new gauge called the US Dollar ICE Bank Yield Index. Detailed information can be found at: https://www.theice.com/iba/Bank-Yield-Index-Test-Rates. The proposed new ICE index will measure the yields at which investors are willing to lend US dollar funds to international banks on a wholesale, unsecured basis, according to documents on the index. It’s aimed at meeting the short-term interest-rate benchmark needs of lenders, borrowers and other cash-market participants, with settings for one, three and six month periods. 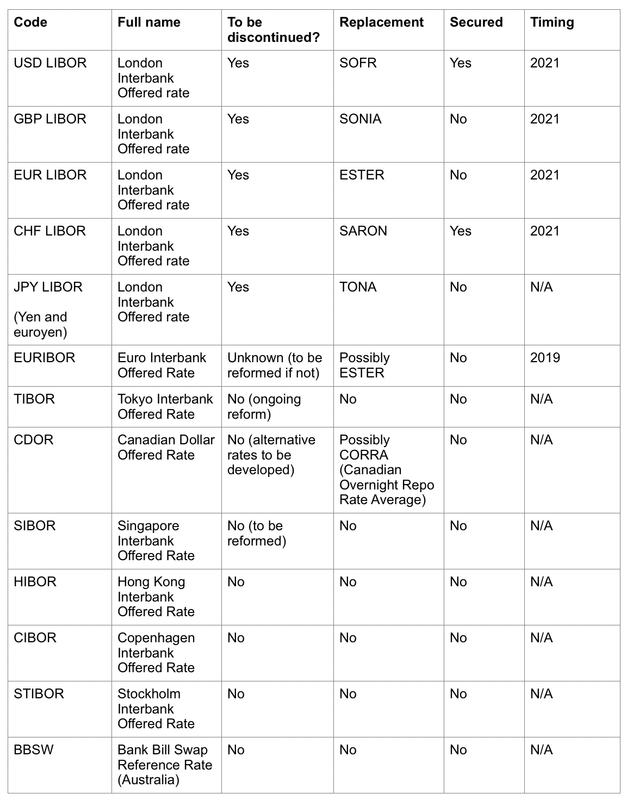 It is not an RFR but an alternative to USD LIBOR based upon rates for submitted for actual transactions. It is essentially a data-driven version of USD LIBOR. This is completely separate to the work that IBA is doing to produce term rates derived from RFRs. The methodology paper benchmarks the level of this new index against USD LIBOR and they look to be very strongly correlated. In theory, you could do a straight swap between the two rates without needing to make any consequential amendments to payment mechanics etc. All you would need to do is tweak the margin and adjust the mechanics for looking up the rate. If the product in question is within the scope of the Benchmarks Regualtion, Supervised Entities (i.e., regulated entities) would also need to think about what fall-back rates would be appropriate to the extent that IBA might discontinue this index. IBA have said that the rate will be published “during the morning New York time” but on the basis of the curve produced for the previous business day, so there will be a one day lag. To keep abreast of important developments as they happen and to receive our analysis of the biggest issues, please submit your details. Please view our privacy notice to review how Fieldfisher processes your personal data through your use of this website and the details you submit through our forms.